Cornelia "Corrie" ten Boom was born in Amsterdam, Netherlands. She was a Dutch author. She was imprisoned for her actions. Ten Boom told the story of her family members and their World War II work in her best-selling book, The Hiding Place, which was made into a World Wide Pictures film in 1975, starring Jeannette Clift as Corrie and Julie Harris as Betsie. 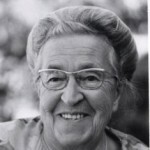 Israel honored Ten Boom by naming her Righteous Among the Nations. Ten Boom was knighted by the Queen of the Netherlands in recognition of her work during the war.